BACKGROUND: This study evaluates the diagnostic yield of esophago-gastroduodenoscopy (EGD) before bariatric surgery and its influence on the planned surgery. METHODS: Endoscopy reports of all patients having undergone an EGD at our endosurgical unit were reviewed. We identified a non-consecutive series of morbidly obese patients that had an endoscopic evaluation before their primary bariatric procedure between July 2006 and September 2008. All patients in the selected cohort had no previous gastric surgery and underwent an EGD for gastrointestinal symptoms. Endoscopic findings were extracted directly from the patients’ original endoscopy report, classified, and analyzed. Other relevant clinical information was obtained from the patients’ electronic medical records. RESULTS: A total of 212 patients (58 Male:154 Female) had an EGD prior to their planned index bariatric procedure. The most common indication for endoscopy was poorly controlled reflux or dyspepsia type symptoms (66%). Overall, 81% (172/212) of patients had abnormalities identified endoscopically. Abnormal findings that did not influence surgery occurred in 99% of patients; and these included mucosal inflammation (53%), hiatal hernias (48%), polyps (12%), and ulcers (2%). Findings that changed surgical management occurred in only 2 patients diagnosed with neoplasia. 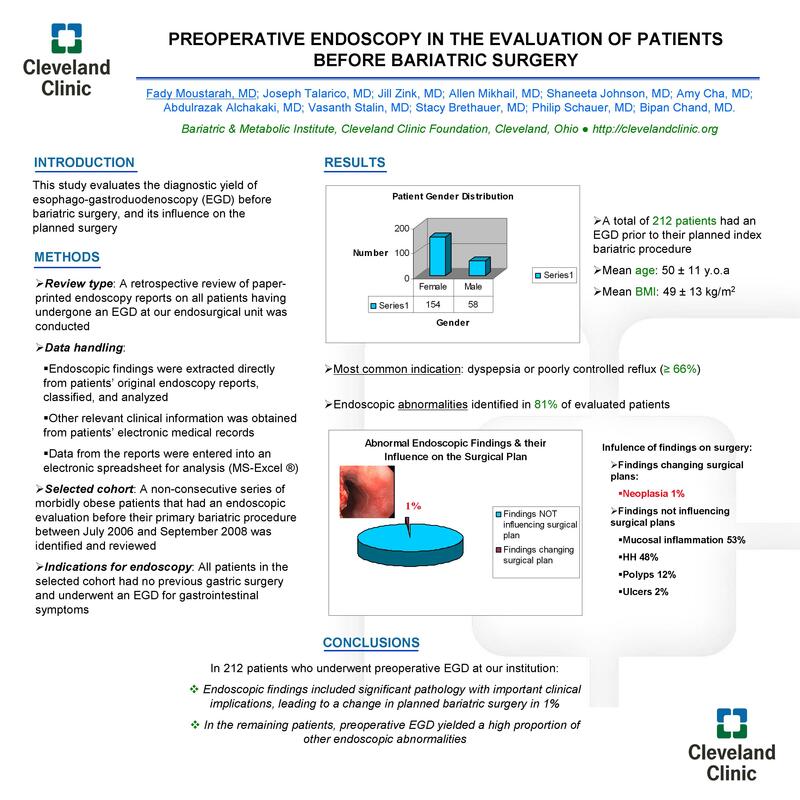 CONCLUSION: In 212 patients who underwent preoperative EGDs at our institution, endoscopic findings identified significant pathology leading to a change in planned bariatric surgery in only 1%. In the remaining patients, preoperative EGD also yielded a high proportion of endoscopic abnormalities.